The crosse (lacrosse stick) is made of wood, laminated wood or synthetic material, with a shaped net pocket at the end. The crosse must be an overall length of 40 - 42 inches for attackmen and midfielders, or 52 - 72 inches for defensemen. The head of the crosse must be 6.5 - 10 inches wide, except a goalie’s crosse which may be 10 - 12 inches wide. The pocket of a crosse shall be deemed illegal if the top surface of a lacrosse ball, when placed in the head of the crosse, is below the bottom edge of the side wall. TO PLAY FOR THE SIENNA PANTHERS THE HEAD MUST BE STRUNG WHITE. A protective helmet, equipped with face mask, chin pad and a cupped four point chin strap fastened to all four hookups, must be worn by all players. All helmets and face masks should be NOCSAE (National Operating Committee on Standards for Athletic Equipment) approved. TO PLAY FOR SIENNA PANTHERS THE HELMET MUST BE WHITE. 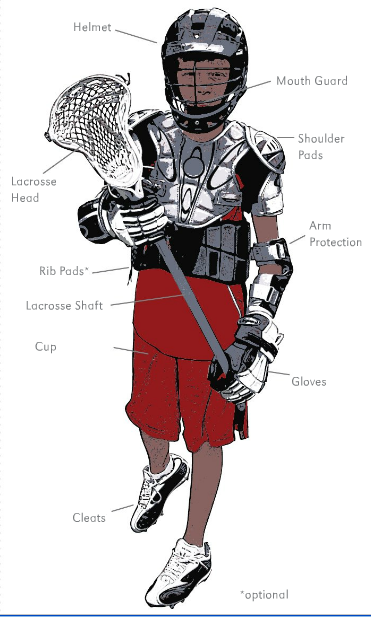 Here is a good guide regarding Lacrosse equipment from Sportstop.com. Click here to view. Click here to see a video regarding basic equipment.